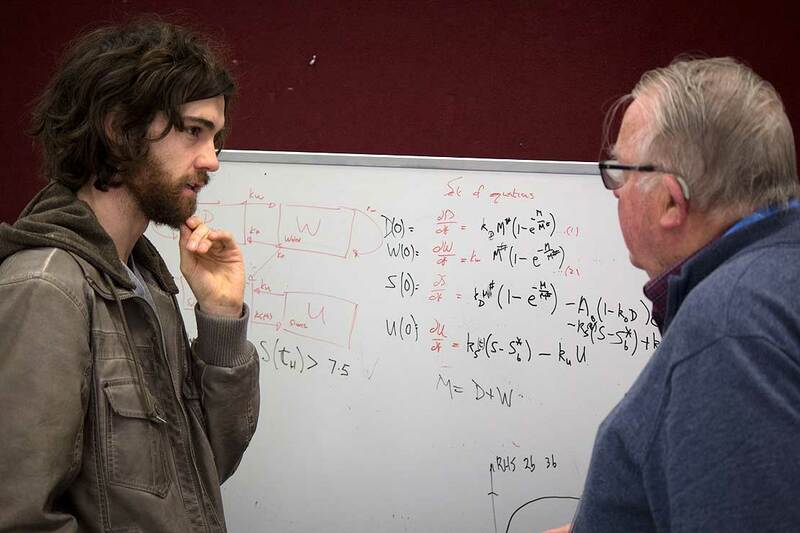 University of Canterbury's Associate Professor Mathieu Sellier in discussion with students. Students and researchers fired up their collective brain-power this week at Massey University’s Manawatū campus to solve real industry problems during a unique study week. Now in its third year and supported by long-time partner KiwiNet, Mathematics in Industry New Zealand’s (MINZ) week-long event brings together a mixture of students and researchers with backgrounds in mathematics, statistics, engineering, and computer science, to solve real industry challenges. This included a mixture of academics and students of all levels from across New Zealand, Australia, South Korea, Fiji, and from Italy. This year the challenges came from six leading businesses in New Zealand, including Fonterra, Zespri, Transpower, Fisher& Paykel-appliances, Sanford Ltd and Horizons Regional Council. The presentations were far from static equations on whiteboards. In particular, the modelling of the mechanical action of a Fisher & Paykel washing machine looked less like mathematics and more like art. participant Marnus Stoltz and Professor Graeme Wake working on a problem for Zespri. Fonterra’s challenge asked their team to predict the flavour profile of their milk powders with students applying both statistical approaches and modelling to analyse the chemicals involved in finding what chemicals caused different tastes. Fonterra’s Lisa Hall, a former participant come challenge setter that has seen the results of the work produced by MINZ. The group’s showed no shortage of mathematical firepower to tackle the issues, with Massey’s Distinguished Professor Robert McLachlan on hand to assist the group tasked with optimising the monitoring of the fresh water network in the Horizons’ Region and Zespri’s group having the considerable experience of Emeritus Professor Graeme Wake. Event co-director Dr Luke Fullard, of Massey’s Institute of Fundamental Sciences says both industry and participant walk away from the week with much more than they entered with. “MINZ is unique because it allows a collaborative approach to industry problem solving, where mathematical scientists tackle real life problems shared by companies. Collaborative brain-storming is a great way of solving problems arising in industry and the environment. “Mathematics is more relevant today as it has ever been. 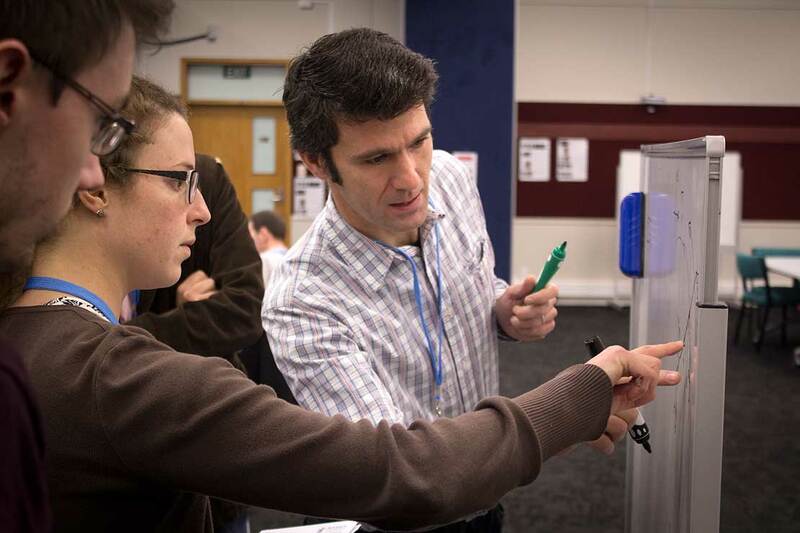 Educators looking for ways to inspire the youth of today in the importance of maths should look no further than the Mathematics in Industry NZ study week. “The study week concept has been going now for over half a century around the world. MINZ is an event which aims to promote the benefits and diverse applications of mathematics by linking mathematicians with industry problems. Another highlight of the week came from Invited guest, Dr Melanie Roberts from IBM Research Australia, who spoke to participants on Wednesday as a shining example of an academic who has made the transition into industry with outstanding success. Her talk explored two problems in the area of weather impacted operations, focussing on the insurance industry and how companies can mitigate and respond to weather events.